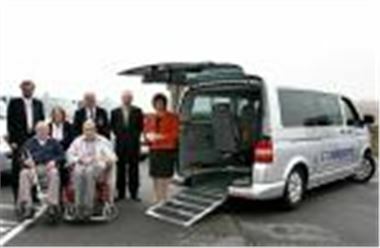 Gowrings Mobility has joined forces with Volkswagen and launched its conversion of the Transporter for wheelchair passengers. Comprising a variety of seating arrangements for up to three wheelchair passengers, seven seated passengers and the driver, the Transporter has been specially adapted with the unique Gowrings Mobility conversion, which features a lowered rear floor section, hydraulic lowering suspension and a lightweight ramp. The ramp incline is shallow to make entry for the wheelchair user and carer as easy as possible. The wheelchair user enters the vehicle via the ramp at the rear and is able to travel in the comfort and safety of his or her wheelchair, which is secured using the four-point tie-down securing system and a lap and diagonal belt for the wheelchair passenger. When Gowrings Mobility assessed the suitability of the Transporter for conversion, the design engineers considered factors such as durability, safety and fuel economy. The Gowrings Transporter offers better economy with improved fuel consumption, low running costs and exceptional driver comfort. The variety of seating arrangements, including the flexibility of folding and removable seats will suit larger families or fleet operators. St Dunstans, the leading charity for ex-Service men and women who have lost their sight, is the first customer to take delivery of five Gowrings Mobility Transporters. As well as accommodating 60 permanent residents, the national centre in Brighton also houses the Rehabilitation and Training departments for the charity, and is used for holiday breaks. The Transporters will enable the residents to make essential trips to hospital and shopping or for outings such as tea drives or lunches, as well as being used to bring people from all over the country to the centre for courses. The Mobility Roadshow takes place at Kembler Airfield near Cirencester on 8th, 9th and 10th June, organised by Mobility Choice, a registered charity, and supported by the Department for Transport. Test drives can be pre-booked at www.mobilityroadshow.co.uk or on arrival at the event. Drivers need to bring their driving licence on the day. With 180 exhibitors, including 30 companies new to the Roadshow, this year's show promises to be one of the best yet. With free entry, parking, crèche and wheelchair loans as well as entertainment for young visitors, this is a great day out for all the family. Find out more at www.mobilityroadshow.co.uk or call Mobility Choice tel 0845 241 0390.